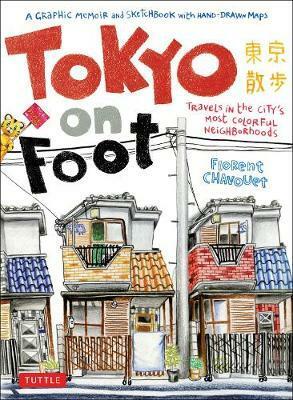 This prize-winning book is both an illustrated tour of a Tokyo rarely seen in Japan travel guides and an artist's warm, funny, visually rich, and always entertaining graphic memoir. Florent Chavouet, a young graphic artist, spent six months exploring Tokyo while his girlfriend interned at a company there. Each day he would set forth with a pouch full of color pencils and a sketchpad, and visit different neighborhoods. This stunning book records the city that he got to know during his adventures. It isn't the Tokyo of packaged tours and glossy guidebooks, but a grittier, vibrant place, full of ordinary people going about their daily lives and the scenes and activities that unfold on the streets of a bustling metropolis. Here you find businessmen and businesswomen, hipsters, students, grandmothers, shopkeepers, police officers, and other urban types and tribes in all manner of dress and hairstyles. A temple nestles among skyscrapers; the corner grocery anchors a diverse assortment of dwellings, cafes, and shops--often tangled in electric lines.